Named in the Chicago Tribune’s list of ’50 Most Significant Songwriters of the last 50 Years’ Austin, Texas based singer songwriter DANNY SCHMIDT has amassed a cult following for his poetic poignant lyrics. 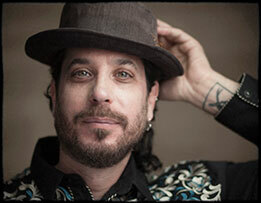 Performing solo armed with just his voice, his acoustic guitar and acute commentary, Danny is the authentic troubadour. One man sharing the truth in the form of songs, unadorned and intimate. The understated effect is powerful. In Spring 2019 Danny will release his ninth studio album ‘Standard Deviation’. As with the previous eight, it contains songs that are so lyrically rich and finely crafted. They carry the power of fine poetry. They accentuate the narrative and celebrate subtlety. The songs are filled with nimble wordplay and cool cadences moving with the light feet of a dancer, but in tone and theme they convey weight and depth and substance. Danny Schmidt is incomparable and a can’t miss performer. His guitar playing is exceptional, where every melody can be appreciated even if there are no words. Everything about the man is gentle, except for his capacity for insight which is crushing. Anyone who can write songs such as ‘Company of Friends’ and ‘Stained Glass’ deserves to be talked about in the same breath as Leonard Cohen and Neil Young. To give you some idea of the power of Danny’s song writing, take a look and listen (video below) to ‘Company of Friends’: ‘I believe in private thunder, I believe in inspiration, I believe in slow creation, I believe in lips on ears’, I believe in being wrong, I believe in contradiction, I believe in living smitten, I believe the book is written by our Company of Friends. Pure genius. Support comes from Yorkshire based song writer GREGORY S DAVIES, who will be accompanied by Jack Amblin on drums and Sam Jackson on bass. Greg has released three albums, the first two combined upbeat blues with folk and country. His latest album ‘Pathfinder’ sees him move into a heavier sound rooted in rock. It pushes themes of hope and unity against the backdrop of an uncertain world. Advance Tickets for this concert are priced at £13.50 and can be obtained from One Stop (Kirton) from Brian on 01652 649230 or www.wegottickets.com. Error: Error validating access token: Session has expired on Saturday, 23-Mar-19 02:32:21 PDT. The current time is Thursday, 25-Apr-19 19:25:07 PDT.